There are many things on my bucket list of life: read War and Peace, learn how to manipulate the manual settings on my camera, write a book of some sort, make Julia Child's boeuf bourguignon, and learn how to can food. But when my friend invited me to make and can my own blood orange and strawberry marmalade last week, I was hesitant. We had returned from France the day before and the day of the jam-making was my husband's birthday. Yet it was Elliott who said, "Go! I want you to learn, and so do you!" So my sweet husband watched our baby alone for several hours on his birthday, all hoping for the reward of some really good jam at the end of the day. I was determined not to disappoint him. Then we all sat down to "supreme" the oranges, which means we removed all the skin from each individual orange section. 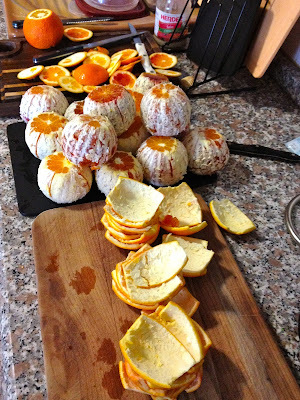 This was slow, tedious work, but it does make a delicious marmalade with no orange skins to get caught in your teeth. Meanwhile, we put all the orange skins to boil on the stove. 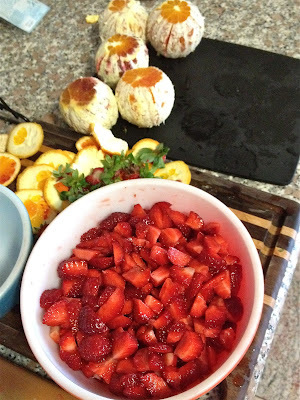 I cut up a big bowl of strawberries to mix in with the oranges. We boiled all our jars on the stove to sterilize them. The jars had been the most enigmatic part of canning to me, but they turned out to be straightforward. We sterilized the jars and lids by boiling them for 10 minutes. We would boil them again when they were full of marmalade. After the oranges were surpremed and the skins had boiled, we mixed the orange pulp, strawberries, and finely sliced orange skins all together. And into the pot they went, along with quite a bit of sugar and the orange-flavored water that had been boiling with the orange skins. And then we let the mixture bubble, boil, and steam for a loooong time. The candy thermometer had to get up to 225 F and it took about an hour to do so. Meanwhile all the windows in my friend Becca's apartment steamed up and we basked in our own marmalade-scented sauna. Finally the temperature reached 225 F and we had our marmalade! We carefully poured it into the sterilized jars, screwed on the lids, and then submerged the jars into a pot of boiling water. With a tea towel on the bottom of the pot in the water, the jars had enough cushion not to break. We let them boil for 10 minutes until the little button in the center of the lids was depressed. Technically, our jars were now sealed, our marmalade was now "canned," and we could leave the jars out for a few months on our kitchen counters. I don't think my marmalade is going to last that long, though, considering the serious dent Elliott, Lena, and I have made in it in the past week! Now here you are. Feast your eyes on the first batch of marmalade made by yours truly! P.S. Many thanks to my friend Becca for contributing some of the photography for this post! I bought some from Desiree and it was soooo yummmy! Makes a great topping for ice cream!